Fits Civic 3DR & 5DR 2006 2007 2008 2009 2010 2011. MANUAL GEARBOX MODELS ONLY (THERE IS A DIFFERENT PARTNUMBER FOR I-SHIFT MODELS WHICH LOOKS IDENTICAL, PLEASE LET US KNOW IF REQUIRED). 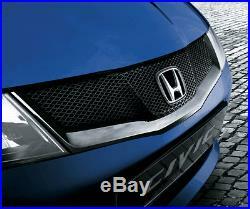 Please browse our shop if you also require a set front or rear mudflaps or any other genuine Honda accessories. Before purchasing, if you would like us to check this item will fit your car, please message us with your car registration and chassis number and we will have a look for you. If you have any questions send us a message, our normal hours of business are Mon-Fri 08:30-17:30 and Sat 09:00-12:00, please be patient for any replies outside of these times. Most of our deliveries are carried out by a courier, so please make sure that there will be someone at the destination address to sign for your goods. The item "Genuine Honda Civic Front Mesh & Chrome Grille / Grill 2007-2011 3/5 Door Models" is in sale since Tuesday, August 15, 2017. This item is in the category "Vehicle Parts & Accessories\Car Parts\Exterior & Body Parts\Grills/Air Intakes". The seller is "johnsonshonda" and is located in Milton Keynes. This item can be shipped to United Kingdom, Austria, Belgium, Bulgaria, Croatia, Cyprus, Czech republic, Denmark, Estonia, Finland, Germany, Greece, Hungary, Ireland, Italy, Latvia, Lithuania, Luxembourg, Malta, Netherlands, Poland, Romania, Slovakia, Slovenia, Spain, Sweden, Australia, Canada, Brazil, Japan, Israel, Hong Kong, Norway, Indonesia, Malaysia, Mexico, Singapore, South Korea, Switzerland, Taiwan, Thailand, Chile, Portugal, United States.